For those following Cisco security, you probably know Cisco acquired Sourcefire last year (more found HERE). The most anticipated release has been adding Sourcefire’s flagship Firepower offering inside Cisco’s most popular firewall offering the Adaptive Security Appliance (ASA). As of September 16th, this offering is officially available. You can find data sheets, configuration guides and more on the new release HERE. This post will cover steps I used to build my ASA with Soucefire lab. You will need a version of the 2nd generation ASA with a SSD drive (NOTE: Sourcefire is not available in 1st generation ASAs). See HERE for the model numbers. NOTE The ASA 5505 is a first gen ASA but there are new models coming out shortly for small business). There are versions of Sourcefire that don’t require an ASA such as a dedicated appliance and virtual Sourcefire appliance however this post will cover running sourcefire within a ASAX or in this case, a ASA5515X. You will also need a management appliance to manage the firepower services. My lab uses a virtualized version of this called FireSIGHT ran via ESXI 5.1. Your ASA must be running at least 9.2 or later as specified on the release page. Type setup and configure the basic settings. Session to the Sourcefire within ASA console using session sfr in the ASA command line (similar to ASA CX). Login with user admin and password Sourcefire. Complete the system configuration. Specify the FireSIGHT management IP address (installation process below) using the following command. Note you need the IP address and make up any key. It can by whatever you want such as happy123 or for my example, thesecurityblogger. You will need this later when you add this to the FireSIGHT management. At this point, all future steps are done within the FireSIGHT management. Now you need to build the FireSIGHT management. You will need to download Virtual FireSIGHT / Defense center for VMWare, which will be a .tar.gz files. I used 7-zip for my windows VM to uncompressed the file since I need windows to access my ESX system (VMware needs to developed a MAC agent!). Have to unzip the .gz followed by untaring it. You should end up with a .vmdk file. Deploy the .OVF file in ESXI and set basic network configuration. 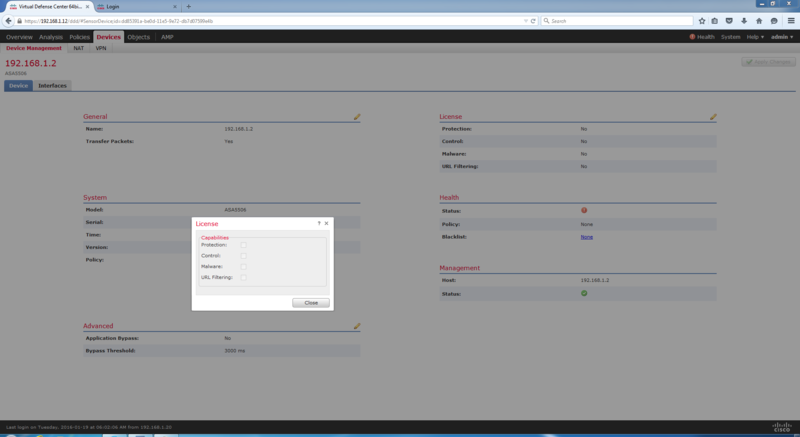 Once complete, you should be able to access your FireSIGHT management GUI using the IP addressed you specified during the basic network setup. Open FireSIGHT in a standard browser and use admin for the user name and Sourcefire for the password. From the GUI, you will be asked to change the password. You can modify the network, time and other basics from the GUI if they weren’t done during the initial setup found under System->Local-> Configuration. Its recommended to enable rule updates, check for software updates and enable geolocation updates. You do this by going to System-> Updates then select Download Updates. Update will appear and state if they require a reboot. Select the present picture to install. NOTE: A reboot will not reboot the core ASA. Sourcefire has its own processing, CPU, etc and runs inside the ASA similar to a separate virtual machine inside a server. The ASA with Sourcefire has three license offerings installed under System->Licenses. The default system gives you Application Visibility and Controls (identifying a iPad, windows system running firefox, etc.) however there is a separate URL license. The URL license gives you all categories such as the need to block adult websites, micro apps in Facebook and reputation security meaning blocking bad websites. For example, most attackers wouldn’t launch attacks from their home network. They would attack you from a new / rouge IP address that based on negative reputation would be blocked by this feature (aka pre attack blocking the traffic before it can hit your network). This typically stops 80% or more daily attacks since malicious attacks must come from a established trusted source. The second license option is IPS/IDS for blocking attacks. The last license is enabling Advance Malware Prevention (AMP) used to identify infected files on the network and endpoints (more on this HERE for only endpoint. The ASA with Sourcefire version is network and endpoint if you include the optional agents). Add a license by clicking add feature license, pasting your license key and submitting the license. At this point, you should be able to add the Firepower services from the ASA. Go in the management GUI to Devices->Device Management, click the Add button and select Add Device. 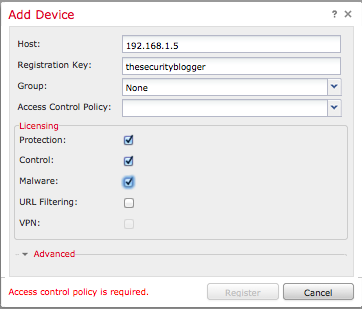 You will be asked to give the IP address of the Sourcefire IP inside the ASA and the key you made up (example shows thesecurityblogger) for the Registration Key spot. You can check which licenses you want to apply assuming you loaded some in prior to this and click add. There are other steps to setting up FireSIGHT such as building access control policies, enabling network discovery to see whats on the network and so on (discovery found under Policies-> Network Discovery then adding a rule to specify the entire network). Before doing that, you should go back to your ASA and configure traffic to redirect through the firepower component of the ASA. NOTE: Without redirecting traffic through Sourcefire, the ASA will just act as a firewall meaning traffic will not be seen by the Sourcefire software inside. Access ASDM and select Configuration > Firewall > Service Policy Rules. Next select Add > Add Service Policy Rule. Click Next. 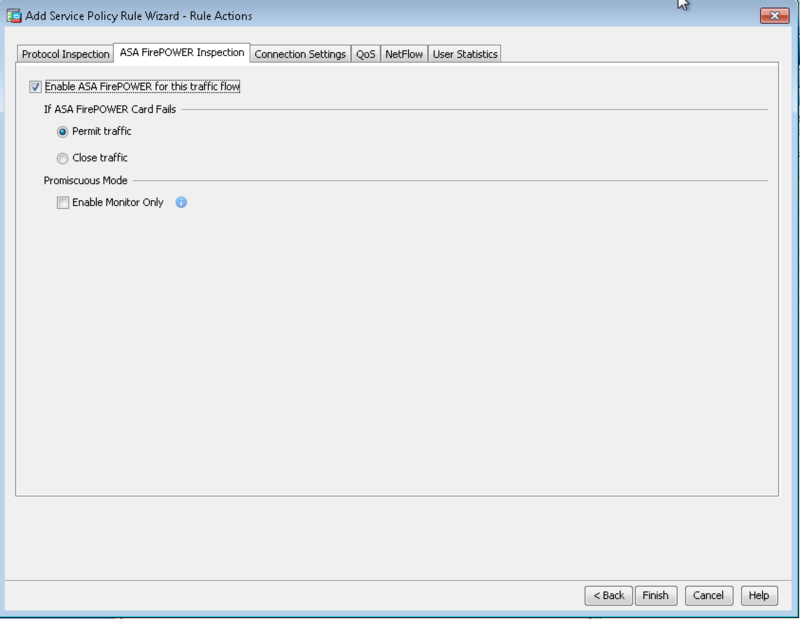 The Add Service Policy Rule Wizard – Traffic Classification Criteria dialog box appears. Provide the basic info and on the next page select the ASA FirePOWER Inspection tab. Check the Enable ASA FirePOWER for this traffic flow check box. Select if you want to permit traffic if Sourcefire fails. Click finish. Very informative. Can you tell me what the maximum throughput is that you are seeing on the ASA 5515x after configuring the sourcefire module? Great article. Any idea how the logging and log retention works? Great article, i ve got a demo of the software Cisco FirePower module up and running on my ASA 5525-X and i am ready to deploy the licenses. Regarding the troughtput, having experience on ASA CX software module do not redirect every form of traffic into the SFR module(try http/https at first). I faced lots of problems with ASA CX at the beginning of the first release(memory leaks,oversubscription(lots of packets pending on virtual rings,high CPU. The 650 Mbps throughput is theoritical and under ideal conditions. For example ASA-CX is not capable to achieve throughput up to 200-250 Mbps (with AVC+WSE). On the other hand FirePower/FireSight is a different product produced by Sourcefire one of the best IDS/IPS vendors worldwide(in my opinion) so i am expecting a much better functionality. Hi Theodore. I agree that I also experienced some large performance hits with CX. Many of us have tested the Sourcefire stuff and it does run a ton faster going this route. Now keep in mind SSL decryption is off box for the next few months but once that is included with the ASA Sourcefire platform, we still expect better performance. Thanks for the feedback. What accesses do I need to download the FireSight VM Appliance. I have two difference CCO accounts, one with tons of contracts included and on both accounts it says “Additional Entitlement Required” Do I need the CON-SAU-VMWSW10 just do download the Appliance. I’ve already purchased FS-VMW-10-SW-K9. If you purchased the lisence file and have the PAK number call Cisco 1-800-553-2447 ask for lisencing and they will take care of you. Thor bless you, im going out from collague but never worked with cisco firewall not mention fire power module, but your tutorial is just perfect for the knowledge i’ve been getting from the official pdfs, thank you very much. Hi, are there any evaluation licenses for the FireSIGHT? If so where can I get them? There doesn’t seem to be any out-of-box evaluation license like it was for the CX. Any here would be great. Thanks! Hi Michael. You will need to reach out to your Cisco support rep to get keys cut. They will ask for your firesight management key as explained in this post and the model number. It should take them a few minutes to issues demo licenses. I don’t see the option to enable Sourcefire in ASDM. What version supports this? Also what commands will allow me route traffic to the SFR module through the command line? The Firepower tab appears in ASDM once you install the firepower software. You don’t have to do anything in ASDM to get that to appear as long as you setup the firepower software correctly. Guys? Its just me running this blog. To answer your question, today (April 17th 2015) you need the external manager known as FireSIGHT for all ASA models running firepower outside of the recent 5506 and 5508 appliances. Those come with a version of ASDM that has some Firepower management features meaning you can get by without the external manager on those but they don’t have the same level of features as having the external manager. It is expected that a later release of ASDM will provide similar functionality for all models of ASA running FP. failover mode / context mode run. Mod-sfr 65> *** EVENT: The module is being recovered. Mod-sfr 69> *** EVENT: Error creating the Disk Image. So your SSD drive is not be recognized by the ASA? Do you have a open TAC case? Have you tried reseating the drive? Do you have the old IPS software, CX or FirePOWER installed? Im see ssd sh inventory and led hd green. I don’t understand how to see the working ssd. reseating and reboot has not helped. Hmmm. What happens when you attempt to run these commands (assuming you have uploaded ASA sourcefire software). Note you can do this via ASDM via the disk manager. Does it say something about the hard drive not found, another version of software is installed or other error? If you can place it in recovery mode, you should be good to reinstall stuff and get it working. There was an error when trying to validate the sfr image but the recovery process will attempt to load the image and continue. Mod-sfr 113> *** EVENT: The module is being recovered. Mod-sfr 117> *** EVENT: Error creating the Disk Image. Hi All, i have having problems, i need to install the firepower software back on the asa 5506 but each time i try and use either http or Ftp i get either an error 103 or failed to connect to host, is there any other way to get this software back on ? First off, note that you first need to install the default Firepower image on the ASA to get into the Firepower CLI. At that point, you need to install the permanent image. If you just have the default system image, it doesn’t save meaning if you reboot it, it will be lost. Are you installing the permanent image at this point and getting kicked out? if I do a show module it clearly shows the sfr in a up up state…. it is the image that is on the asa , it shows me that the sfr module is up up. Bandwidth Throttling is available in pretty much all Cisco content filtering products except Firepower right now. That’s coming with FirePOWER 6.1 released this spring (march 2016 time frame). There are some work around ways of doing it but for now, the official bandwidth throttle feature we all want is 6.1. For newer dropbox accounts, make sure your dl=1 (the default for me is 0, which required a web redirection). 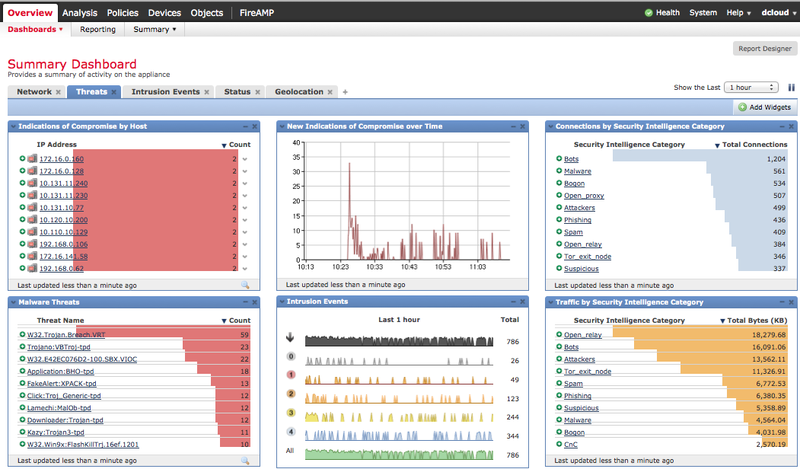 I have ASA 5506-X and Virtual Firepower management center (FMC), both 6.0.0. The ASA Firepower is running with Protect license, and it is shown in ASDM. But FMC shows that the device is unlicensed. This is really confusing. And I can not find any place in FMC to add license for the device. What should I do to make the ASA5506-X Firepower work with FMC? Thanks. But in my case I can not tick any of the boxes. This is screenshot with the checkboxes http://i.imgur.com/ZczZoW1.png. They are faded, I cant tick any of them. I tried with both Firepower and management center v5.4 and v6.0. I guess it is a Cisco’s bug? It looks like you haven’t uploaded any licenses to your firepower manager including the ASA connector license. You will need to do that or you won’t be able to apply licenses. I just posted about doing the same thing using ASDM so if you do have licenses, you could try that approach and see if they upload there. ASDM doesn’t make you apply them meaning you just upload and they stick. My guess is you are missing the controller license for that added ASA. Feel free to share a screenshot of your uploaded licenses to my via jomuniz at cisco dot com. Also check out my blog post on licensing. these is what my cisco SE security told me to do. note that ASDM is not an option to manage the Firepower Threat Defense image. You need to use FMC in order to manage, so make sure you update it to the latest version as well.